YAY! I'm so excited, my partner is fantastic and I can't wait to get started! I sent in my questionnaire last night at like...10pm. So I'm not sure if I made it in time, but if I did, I'm so excited for partners! I used to do a lot with beads in my day, so I have a huge stash that I haven't touched in a long time. More recently, I've gotten into mixed media jewelry, lots of felt, embroidery, and fabric/fiber stuff. I've worked a little bit with polymer clay but probably won't use it for this swap. I'm really excited because I have looooots of ideas. That's so beautiful! I really can't wait to learn to weave. I just hope I can eventually make something that gorgeous. WOW. This is *so* cool! What a lucky little boy! I *love* your modifications on Lavalette...what size needles did you use? Hi everyone! Sorry it's taken me so long to post this, but last week I received from Disco Queen Highness. 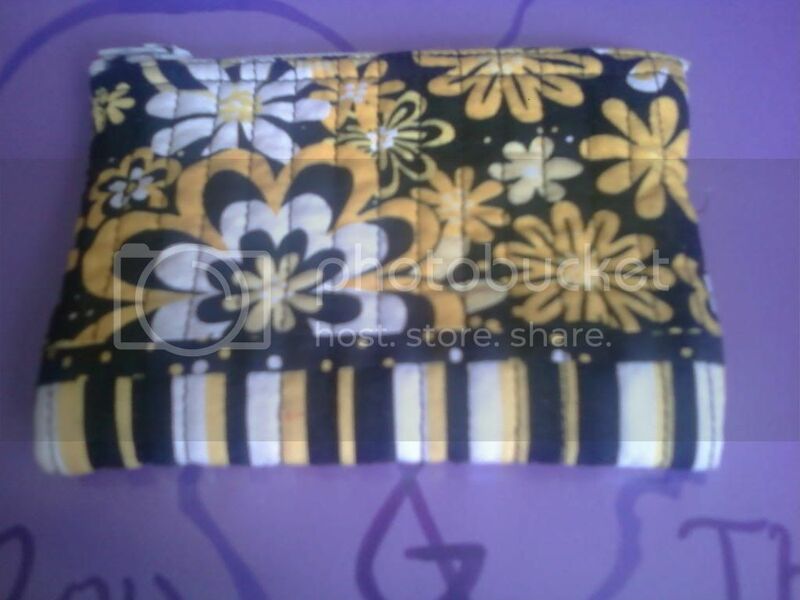 She sent me a really great quilted coin purse that incorporated my themes (and retroactive themes :-P ) of yellow and flowers. Plus, I live in Pittsburgh, so this is really appropriate! Thank you! Up until last night, it held around five dollars in spare change, plus every bobby pin in my purse. That dress is absolutely gorgeous. I *love* the polka dots. So I did a little shopping today for this and found some things that I think will work...I want to wait until Disco Queen Highness gets back before I start working, though!